Crazy pants can be hard to match sometimes. These ones are especially challenging with the white base color. Even though the design is blue I find it safe to wear black with them. I even wore my tie dye sports bra to bring the pattern together. A helpful hit to all of you out there who love Lululemon but hate their prices, as a member of Core Power Yoga Studio you can do more than just yoga, you can shop. They always carry a great selection of cute Lululemon products. But my favorite part is that they have great sales! And if your at the studio as much as I have, you will be able to keep track of when things go on sale. 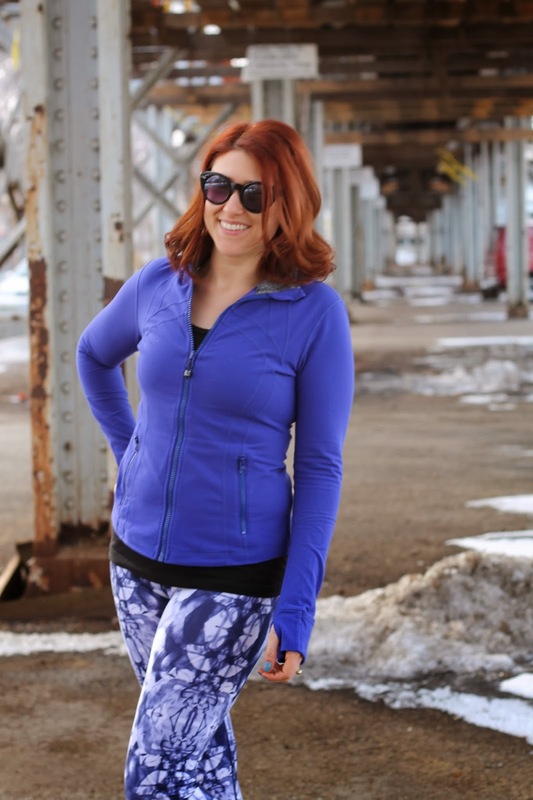 Both the jacket and Pants you see here were bought at the South Loop Core Power with 25% off! Pretty sweet huh? Go check them out and do some hot yoga while your at it! Since all of what I'm wearing is old here are some cute Target finds for you to shop! Lululemon for 25% off?! Umm.. yes please. Also, Target has suprisingly great workout gear! I'm always so impressed with their stuff!